If you’ve been following along on my One Room Challenge, you know that for a few reasons I decided to makeover both our guest bedroom, and our son, Orion’s bedroom. I could not be more excited with how the rooms turned out! As to not overwhelm you, I’m sharing the guest room reveal today and Orion’s tomorrow. The guest room, is very Zen and Cali-calm; a perfect end to the chaos in transforming the spaces in five short weeks (two of which I was traveling)! First off, our old bed was a DIY gone wrong and needed replacing. I knew I wanted a low profile one for the room to feel like a cozy retreat. I feel in love the slight curved sides on the GrandinRoad headboard. This design element makes the sleek Scandinavian design also inviting. As a bonus, it’s so sturdy. I’d highly recommend this bed for small space or city living, you can’t bet the price for the quality.! The beautifully thick Frontgate rug adds so much warmth and texture, and adds a foundation to the room that it desperately needed. The Monocorvo linen by Schumacher is elegant yet has a fresh, airy ease to it. That’s a very delicate balance to hit and exactly what I was hoping to achieve with this room’s aesthetic. 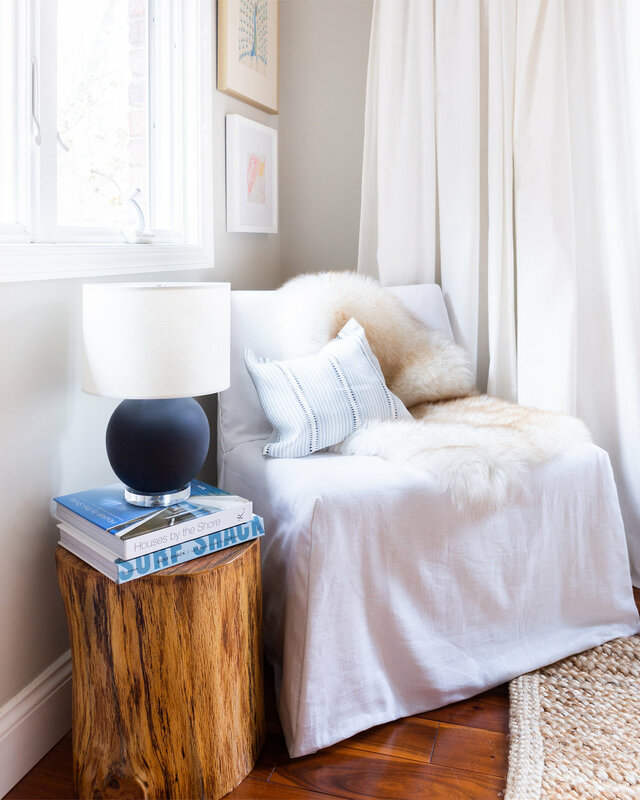 The lamb throw and slip covered chair turned the once cold corner into the coziest of reading spots. The burl wood nightstands, black gilt mirrors, and Moroccan wedding blanket add depth to make the room feel like it’s already been loved and lived-in. Finally, I wanted the greenery to look ethereal as well. 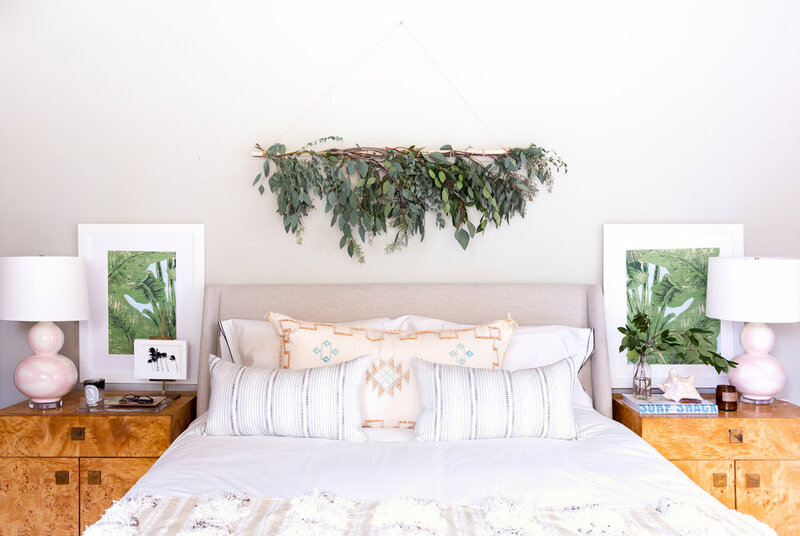 As I mentioned last week, I used Sarah Sherman Samuel’s and Love on Sundays DIYs for inspiration for my eucalyptus garland. I couldn’t be happier with it and the room smells so good to boot! I hope you’ll come by for our son’s reveal tomorrow! Special thanks to my photographer, Marta Perez, for getting the photos back to me for both spaces in 24 hours! Also to Emily Schoen for her impeccable styling assistance!